INTRODUCTION: Show slides of the top gift ideas for today’s teenagers according to Amazon wish lists. Wow… those are just some of the top gifts today. I guess a Red-Rider BB gun is a thing of the past. No G.I. Joe with the kung fu grip? When I was a kid I wanted… share personal story about what you wanted. Well… I love Christmas. Christmas decorations, turkey, family… Share personal story why you love Christmas so much… and one of the decorations you see every Christmas is the Nativity scene—a display of some sort representing the original Christmas and the birth of Jesus. 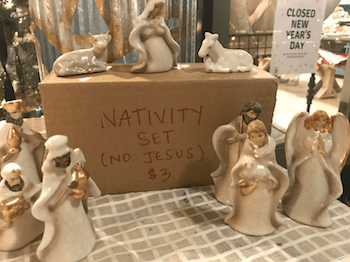 Some stores even sell these Nativity scenes. Here’s one that was on discount last year. Show slide of Nativity with missing Jesus. Sadly, this is probably a true representation of what Christmas is becoming in our world, a celebration that is missing the very object of celebration. It’s like we are all so caught up in Christmas “stuff”… we’re forgetting the whole reason we’re celebrating in the first place. Don’t worry… you’re not alone. This is a common struggle. In fact, it happened to Jesus two thousand years ago to his face when two sisters invited him over for dinner. Open your bible to Luke 10 starting in verse 38. Is there anything wrong with cooking? Anything wrong with having someone over for dinner? Then what did she do wrong? She allowed her serving and prep to draw her away from the peace of just hanging out with Jesus. In addition she allowed her cooking and cleaning to become a source of bitterness and resentment between her and her sister. Think about this. Mary and Martha wanted to get to know Jesus. They thought, “I know, let’s invite him over for a meal!” Martha was a great cook, so why not use her skills, her gift of hospitality to connect with Jesus. Funny… her very strength—cooking and hospitality—became a distraction. The very festivities planned to celebrate Jesus coming to connect with them distracted her from connecting with Jesus. When do you allow good stuff to become a distraction in your life? Do you think we can relate to the word “distracted” today? In a world where young people spend an average of 9 hours a daysoaking in entertainment media, and parents spend over 9 hours a day? All this in on that device that we carry around in our pockets. The average adult is only awake 16 hours a day. Do the math. This doesn’t leave a whole lot of time to walk the dog, get coffee with a friend… or play with your children! We are distracted. Picture what this looks like in the typical home: the adults are staring at the TV, the kids are streaming something on a mobile device, the toddler is flicking colors across the screen of her new iPad… and the dog is on the treadmill because no one will walk him! Our devices definitely can distract us. Ask this lady. Show video of lady falling in fountain. Isn’t it funny that a device designed to connect us with others can disconnect? Isn’t it sad that a holiday designed to celebrate the coming of Jesus now distracts us from connecting with Jesus? Pause for a moment. Answer this question in your mind: Sometimes I allow _______ to become a distraction in my life. SAY BIG IDEA:In a world overflowing with distractions and connections… there is only one connection worth our concern. So what does Jesus say? What does Jesus feel about this distraction in our life? Let’s read the rest of this passage. Don’t worry over all these details. She got so caught up in the details she missed the main event! Sample story: Share personal story of when you became distracted and missed something important. I remember a time when my daughter was at her soccer game and I was taking pictures of her with my iPhone. Of course, I was looking for the perfect moment, so that took a while, and when I finally did capture a pretty good picture, I then decided it would be cool to post it on Insta. So you know how that goes. I framed it perfectly, found the perfect filter—couldn’t decide between Ludwig or Perpetua. Then of course I had to add the perfect caption. While I’m busy doing this, face buried in my screen, my daughter dribbles down the field, makes an amazing cross and her team scores. The crowd yells and I look up asking, “Huh? What?” Of course later she comes up and asks me, “Dad, did you see my assist?” Nice! Huh? I went there to watch my daughter play, to support her in something she likes. And even though taking her picture might be something fun and a great way to record the event, I allowed it to interfere with my whole purpose for being there in the first place! Martha allowed her work to become her “one thing” instead of the “one thing” Jesus offers us. What “one thing” did Mary find while just sitting and talking with Jesus? Here’s where this story is so relevant to us today, especially during Christmas. Jesus came down to earth for one reason, to be with us. Think of the Christmas word we hear all the time, the name of Jesus, “Emmanuel.” That name literally means God is with us. God wants a relationship with us so bad that he became flesh, he became human and dwelt among us in the person of Jesus. The funny thing is, we do the exact same thing Mary and Martha did. We invite him into our lives. Then some of us connect with him and talk with him. But some of us allow so many things to distract us, that even if we had good intentions to connect with Him, we allow the distractions to get in the way. Are you spending time connecting with Jesus this season? What is distracting you from the “one thing” God has for you, the joy and peace- that prizethat comes from putting our trust in him daily? What distractions might you need to trim out of your life so God has room to grow? REPEAT BIG IDEA:In a world overflowing with distractions and connections… there is only one connection worth our concern. Why do you think it’s becoming easier to forget Jesus during the Christmas season? What did Martha allow to distract her from connecting with Jesus? How did Jesus respond to her? What might you be allowing to distract you from connecting with Jesus? Is there something you could do to avoid this distraction? 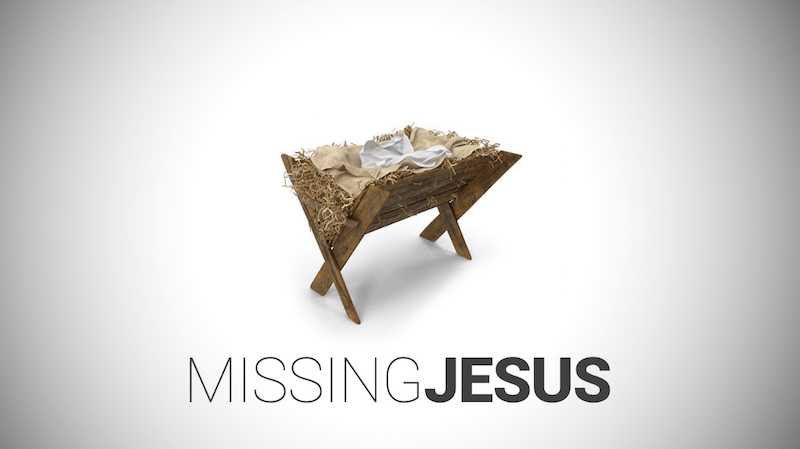 How can you seek out Jesus during this Christmas season?